Home » Holiday Gift Certificates Available! Be a hero this holiday season – give the gift of beer and running! 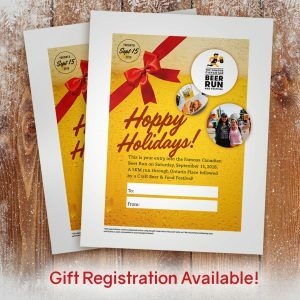 Gift registrations are now available for purchase – just in time for the holidays! Forget about bad ties and socks that’ll be cast aside; with a Famous Canadian Beer Run gift registration, you and your friends can look forward to beer all year long! 2)	Download our adorable Gift Certificate here, fill it out and put in under the tree! 3)	Don’t forget that the recipient must claim their gift registration BEFORE the event sells out! We recommend claiming the registration as soon as possible after it has been received.